The legendary Sweet Tooth, in an autoflowering package. 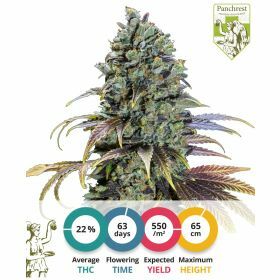 This strain was popularized by Barney’s Farm in Amsterdam and its non-autoflowering parent has won several cannabis cups in the past (most notably: High Times cannabis cup 2001). 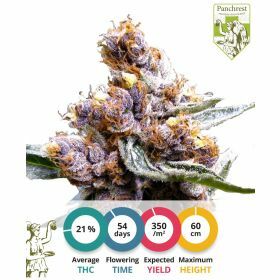 The genetics of this strain have carefully been selected and have been used to create a very stable strain. The plants that grow from these Sweet Tooth cannabis seeds are resistant to a lot of threats and the end product is miraculously sweet. Sweet Tooth’s genetic background goas back top landraces from Afghanistan, Nepal and Hawaii. It has been crossed in with a small Ruderalis to give it its autoflowering capacity. 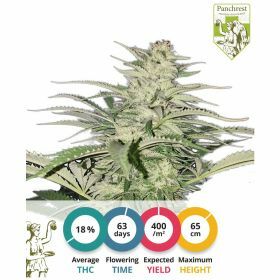 Sweet Tooth autoflower is a very easy to grow plant, especially good for beginners. This plant will give you nice harvests without the need to take care of it extensively. Just give it some water, some nutrients (not too much) and a nice climate. The supreme genetics will do the rest. Make sure you do no overfeed it. 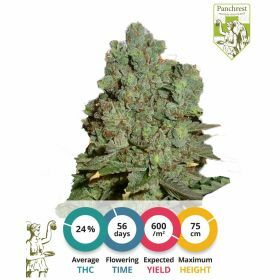 Small amounts of nutrients are enough for this indica-dominant autoflowering strain. When feeding these plants extensively, they will grow hard and produce a lot of buds. The problem however is that the smell and taste that characterize this Sweeth Tooth strain will disappear as snow disappears under the warm sun. This strain is not to be grown for its immense yields, but rather for its unique taste and smell. The effect of the herb that is harvested from the plants grown from these Sweet Tooth auto cannabis seeds is spectacular. It is easily described as an extreme high, without a couch lock. The effect is similar to that of a true sativa plant, but it is not as psychedelic as the effect of these long-flowering cannabis plants. The effect of the bud harvested from these Sweeth Tooth cannabis seeds is simple, elegant and unique. Its taste is as sweet as refined sugar. The effect is as clear as a midday summer sky, it will blow your mind and you will still be able to think and do whatever you planned to do. Miraculous!